Turkana, the second largest of all 47 counties, is covering 13% of the Republic of Kenya’s surface. Although only known to few outsiders, it offers a range of unique landscapes and ecosystems as well as an impressive, intact traditional culture. 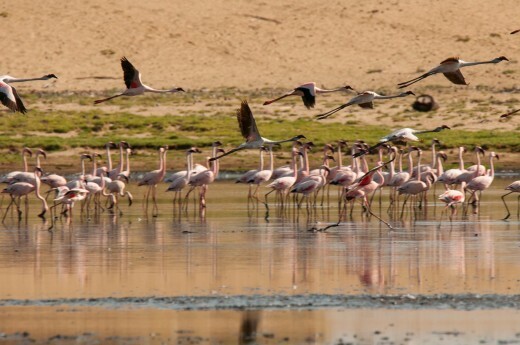 Whether you are after bird watching, a wildlife safari, archeological experiences, relaxing on the beach or simply out for new discoveries – Turkana has it all! 1. Central Island National Park – Exit our planet! As its name suggests, Central Island grows out of the water in the middle of Lake Turkana. Being of volcanic origin, the island owns three crater lakes, one being home for tilapia fish, another one for thousands of flamingos and the third one for crocodiles. Central Island is also an important breeding place for crocodiles and a diverse avi fauna, and this is why it is protected as a national park. You can explore the island on foot, it takes only about one hour to climb the highest point from where you enjoy unrivaled vistas over Lake Turkana. If equipped with a tent you may also stay overnight which will give you the chance to watch the changing colors of marvelous sunrises and sunsets, and the glittering of myriads of stars. As you have to share the island only with a few rangers, thousands of birds and an unknown crocodile number, and because the volcanic landscape is so weird, be prepared to have an out-of-this-world feeling … The ultimate place for lovers of birds, great landscapes and serenity! 2. The beaches of Eliye Springs – Relax kabissa! Just 50 kilometers east of Lodwar lies Eliye Springs, a small resort that, back in the 1970s enjoyed astonishing popularity with the international jet set who flew in from Nairobi with private planes to spend a weekend angling on the lake and partying on the beach. 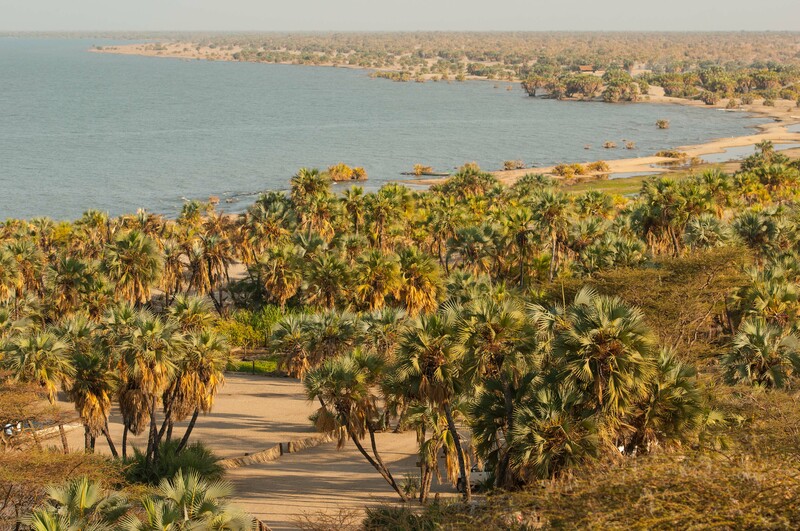 Eliye Springs surely is the greatest place to unwind: It has a very laid-back atmosphere, endless palm-fringed sand beaches, a massive sand dune from which you enjoy a panoramic view of Lake Turkana, and a lack of mobile network. So Lodwar people come here on the weekend when they want to be unreachable and enjoy total peace and fun. Close to the name giving mineral spring there is a comfortable lodge with good food, and further down the beach you will find a number of basic campsites, all being fit to offer you total relaxation to end your Turkana safari with. ‘Kabissa’, by the way, means ‘completely’ in Swahili. 3. Ferguson Gulf – Become a fisherman! Ferguson Gulf is a huge bay full of shallow water, confined towards Lake Turkana by a sandy ridge overgrown by doum palm trees – a terrific landscape! 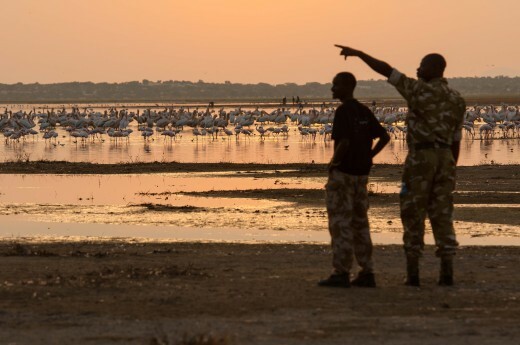 Everybody around seems to be busy fishing, thousands of pelicans, flamingos and yellow-billed storks as well as the local fishermen who practice their trade with sailing boats, canoes with outboard engines or traditional rafts which supposedly are the most ancient vessels of humankind. It all explains why the nearby town of Kalokol is the center of Turkana’s fishing industry. At Ferguson Gulf, you can watch the work of the fishermen and accompany them as they go out to the lake, do some bird watching or simply come to marvel at the sunrises and sunsets which turn the orange waters into fluid fervor. 4. Kalokol Standing Stones – Talk with the people of stone! People don’t expect a mythical experience right next to the main road. But so it may happen at Namorutunga when you drive from Lodwar to Kalokol. A gang of local elders can tell you all about the people of stone, which is the literal translation of the local name of the site. As the tale goes, the basalt pillars once where people dancing who was cursed and turned into stone by an angry sorcerer. Archeologists are not so sure that this is the true origin of the site but rather suspect that it has been a place of worship since approximately 2,000 years. Whatever the truth might be, it is beyond doubt that Namorutunga has been a spiritual power place for people since a very long time. The local Turkana still pray here, which you can tell by the many pebbles that are placed on the stone pillars. When you pay a visit, talk to the people of stone or simply have a look at the open air temple which is presumably two millennia old. 5. The hot waterfalls of Kapedo – Jump into Mother Nature’s bathing tub! On arrival in Kapedo, the border town of Baringo and Turkana County on the road running up from Lake Baringo, visitors probably will rub their eyes in disbelief when they see the major attraction of the region: Two boiling hot waterfalls that plunge over a small escarpment before merging with Suguta river! Kapedo itself is a picturesque village where traditional grass thatched huts prevail. The surrounding has also a lot of charm with Silali volcano to the east and Tiati hills to the west which both are a rewarding hiking terrain. 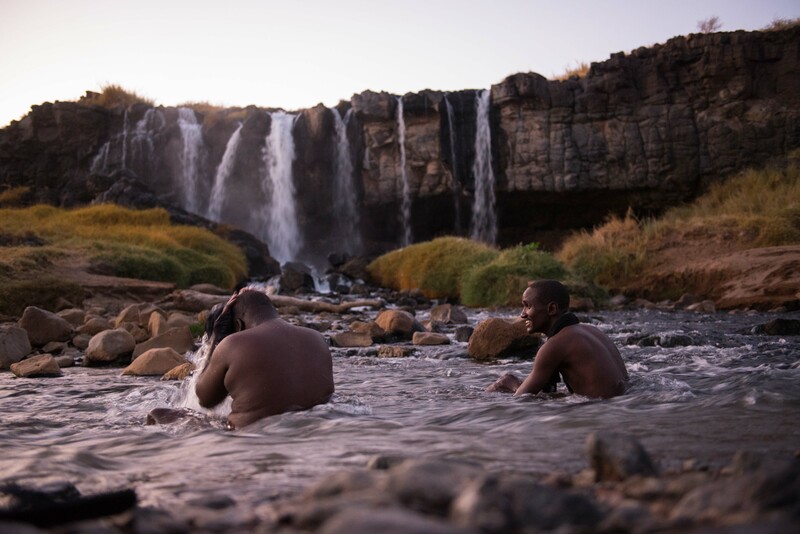 After walking the hills you can treat your tired legs with a swim in the huge bathing tub of Mother Nature, the warm waters of Suguta river. Whether you prefer it boiling hot or lukewarm, you will find the right water temperature depending on how close you are to the merger of the hot streams with Suguta river! 6. 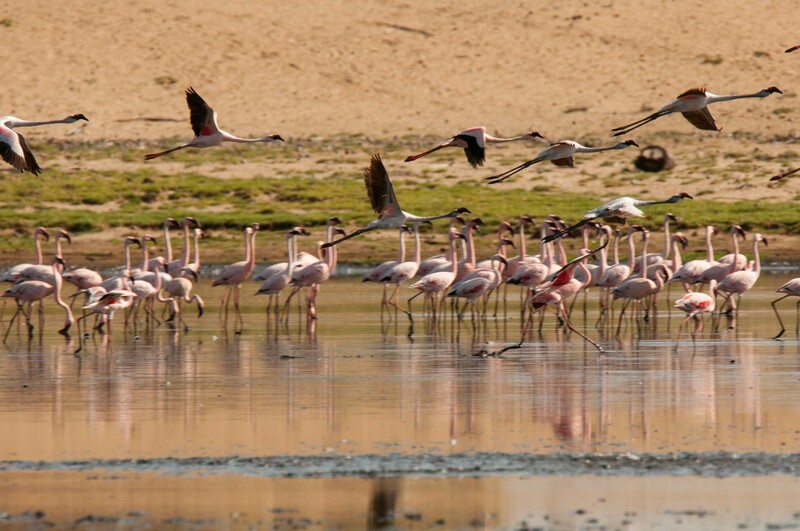 Lobolo Swamp – Mingle with flamingos! A unique ensemble of sand dunes, lake scape, doom palm trees, and a swampy lagoon characterize the area of Lobolo swamp. Myriads of flamingo, holy ibis, and other waterfowl have chosen it as their stomping ground. In case you are a bird watcher or merely a nature lover, you will enjoy staying and unwinding here very much! There is an exclusive tented camp near a natural spring covered by a shady palm groove, right at the shores of beautiful Lake Turkana. 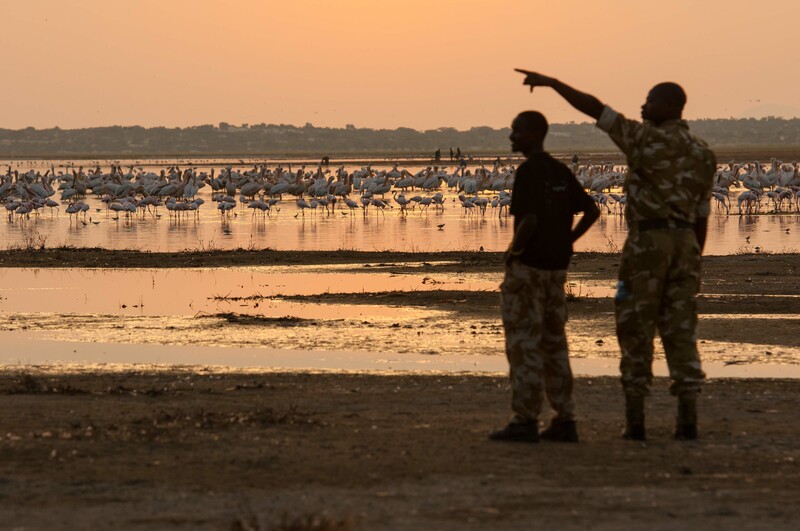 Whether you simply want a calm time to unwind or explore the surroundings on foot together with the camp’s naturalist and mingle with the resident flamingos, you will have a rewarding time in Lobolo, just some 20 kilometers north of Eliye Springs. 7. Turkana Tourist and Cultural Festival – Dance and chill with the Turkana! Thousands of people from Turkana, the neighboring countries of Uganda, South Sudan and Ethiopia as well as Nairobi and from overseas flock to the annual Turkana Tourist and Cultural Festival which is held at Ekaleez Centre on the fringes of Lodwar. The festival program is diverse and comprises of the display of traditional Turkana houses, an exhibition and trade fair for companies and organizations, a market with traditional products, such as bead works and woven baskets and, most important: a popular stage program. 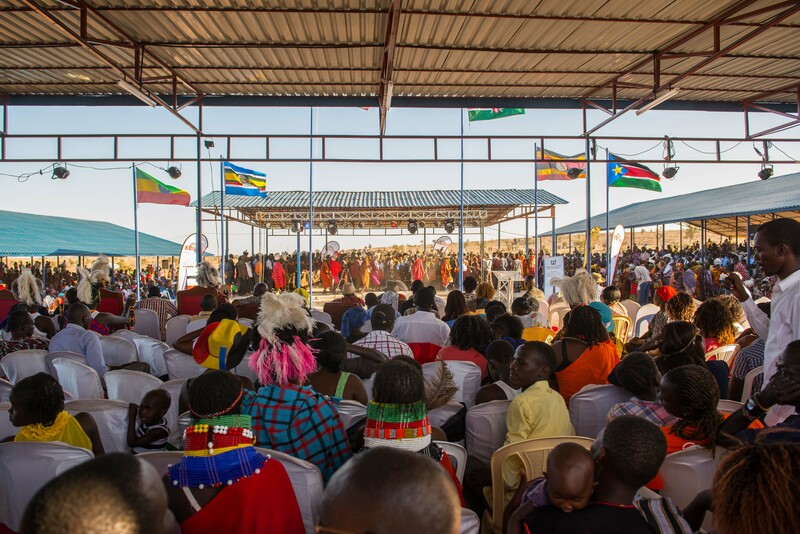 Dance troupes from all over Turkana display their artistry and various famous Kenyan singers boil up the crowd. At night, when the air gets as smooth as silk, the festival grounds turn into a huge nyama choma area, where people sit under the sparkling stars, listening to music, talking, eating, laughing and making new friends until dawn – the festival atmosphere at its best! 8. 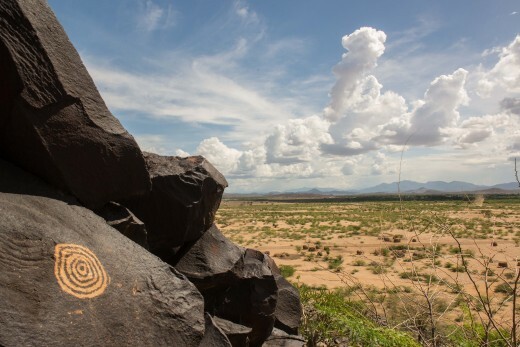 Lokori Standing Stones and Rock Art – Become a researcher! 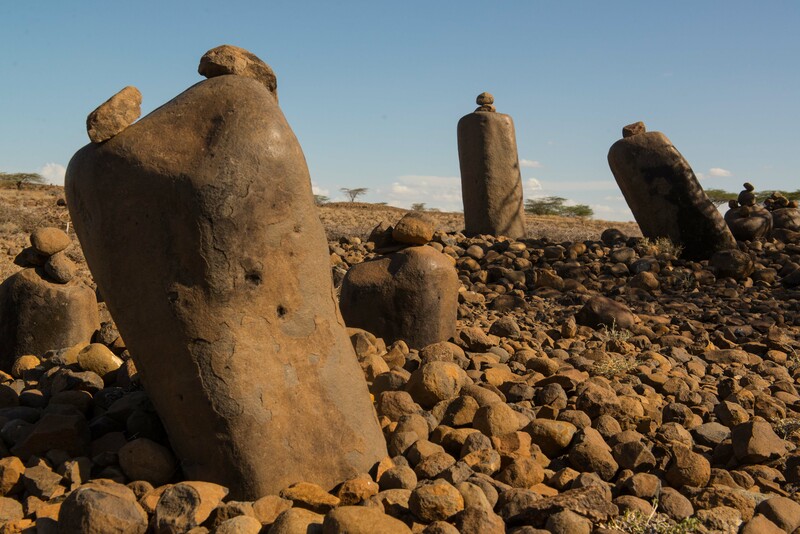 In Lokori, not too far from the banks of Kerio river, there is one of Turkana’s most impressive archeological sites, an ensemble of numerous circles of standing stones and two hills bearing mysterious rock art engravings. 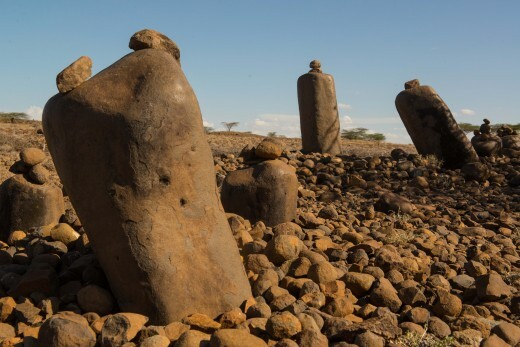 The local people will insist that the standing stone slabs once have been dancers turned into rocks by a wizard, similar to the stories you might have heard at the Namorutunga site near Kalokol. But again, archeologists suspect other origins. Whether a graveyard or a site with another purpose – it surely must have been a place of important rituals. When you come to Lokori, catch up with the spirit of the place, imagine to be Indiana Jones and try to figure out the meaning of the many enigmatic rock art symbols on the nearby hills. Can you guess their significance? 9. Nariokotome Turkana Boy Monument – Meet our ancestors! Where do we originally come from? Possibly from Nariokotome, near the shores of Lake Turkana! This is at least where the remnants of the world famous Turkana Boy where found, a near-complete skeleton of an approximately 1.6 million-year-old Homo erectus. This early human species is generally regarded by scientists as one of our direct ancestors. 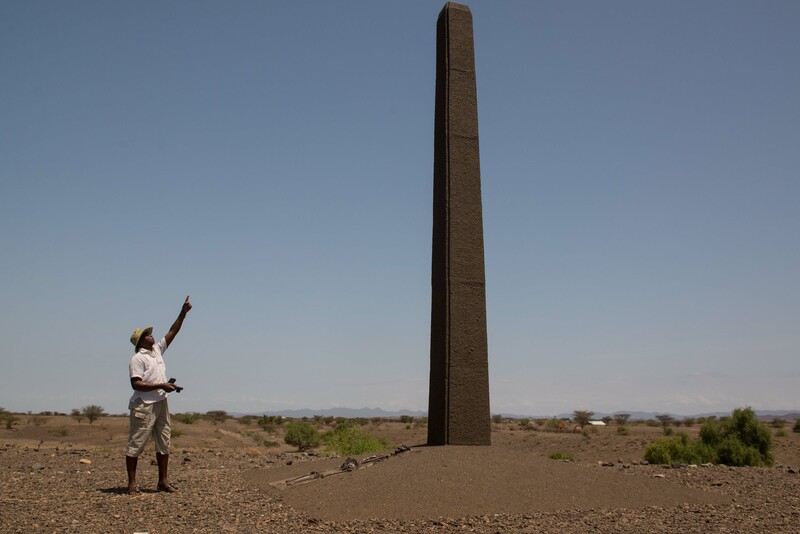 A monumental pillar and a brass replica of the Turkana Boy mark the spot where Kamoya Kimeu, a researcher of Dr. Richard Leakey’s scientific team detected the fossil in 1984. Many more important hominid findings have been made in other parts of Turkana County such as the oldest known stone tools with a suspected age of 3.5 million years, which support Turkana’s claim to be the Cradle of Mankind. 10. South Turkana National Reserve – Have your private nature park! When traveling from Kitale to Lodwar, most people drive past Turkana’s largest nature reserve without even sensing what they are missing. South Turkana National Reserve is probably one of the least visited nature reserves in the whole of Kenya but it is a hidden gem! Chances to meet other tourists there are minimal. So why don’t you just fancy to possess your own private national park?! You can explore South Turkana by 4WD or on foot. You may see oryx antelopes, gazelles, warthogs, a wonderful birdlife, even lions and leopards and most prominently: elephants! Animals are shyer and harder to trace than in the popular parks of Southern Kenya, but in exchange for that, you don’t have to share them with a pack of minibusses. 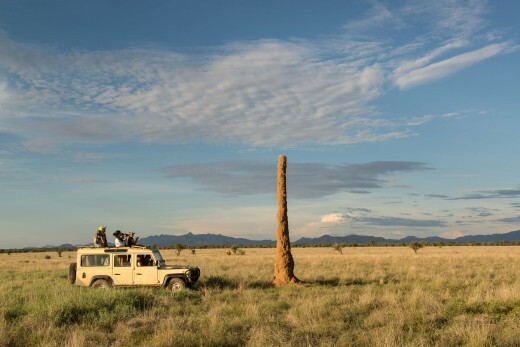 The true adventure of South Turkana is its scenic beauty of vast plains with anthills of record-breaking height and singular mountains, anyway.